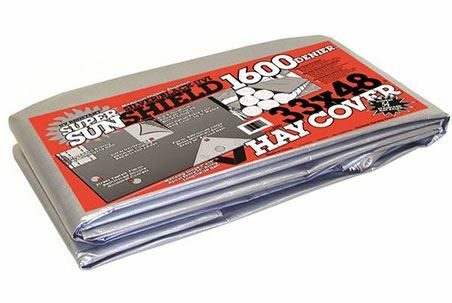 Dewitt hay tarps are constructed of 6 oz and 8 oz woven fabric which provides strength and long term durability. 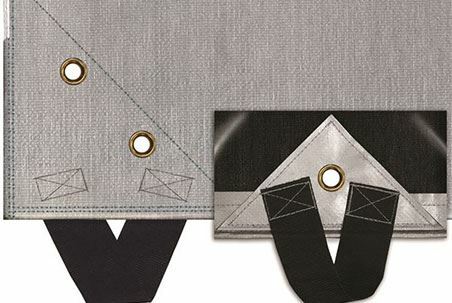 The tarps are UVI treated which provide resistance to ultraviolet breakdown and extend the lifespan of the material. You spent a great deal of time harvesting your hay but is it lasting for a long period of time? Here are some suggestions that might help you out. Let's face it, the cost for expensive machines, the cost of fuel, and expensive crew labor is driving your costs through the ceiling when it's time to harvest hay. Adding to the costs, hay has become short in supply! It only makes common sense to preserve high-quality harvested hay so it will last for a longer period of time. In technical terms, hay is grass or legume plants that have been cut, dried, and stored for future use to feed grazing animals including horses, cattle, llamas, goats, alpacas, and sheep. If you own a dog, you probably know you should not continually change out their food with another brand because it will make them sick. The same is true with grazing animals if their hay is changed out on a continual basis. Because changing their feed will upset their systems, it's strongly recommended that you put up a good amount of the same kind of hay that will last throughout the season. This is the traditional rectangular shape with wire or string used to tie the bales together. As a general rule, these bales are approximately 2x2x4 feet in length and width and weigh approximately 40 to 100 lbs. Although these smaller bales are easier for feeding, storing will take a great deal of work, is costly, and will require a good deal of time unlike larger round or square bales. These rectangular bales are usually 3x3x8 feet in length and width and weigh in between 600 to 800 lbs. 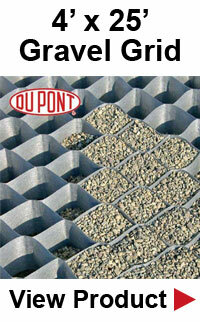 They are easy to use and break off in flakes just like the smaller bales. Unfortunately, you will need a tractor with a loader to move these bales around. While these bales are the most economical and weigh in at 500 to 1800 lbs, they have their drawbacks. Rounds bales are designed to be fed whole in the field with or without a hay ring. The ring's sole purpose is to prevent your animals from lying in it or prevent them from pulling down the hay and wasting it. You can remove sections for feeding by unwinding the bale and then forking off sections. This, however, is hard work and still will result in a great deal of waste. Unfortunately, once you have opened and exposed large round bales to the elements, they will start to spoil. Therefore, unless you can ensure that your animals will finish off one of these bales in three days, this is not a good option. In order to protect your hay's value from the elements, you want to store it in a building that has good ventilation and doesn't leak. Use a building that is in an elevated, well-draining area. Because hay is dry, it's also highly flammable so make sure your barn is not overheated if that's where your hay will be stored. Your barn could catch on fire so if you have another building just for hay, that might be the route to go. Only have small amounts in your barn if it's the only option you have. Keep your hay far away from machinery, trucks, or other heat sources or fire accelerates such as gasoline, kerosene, oil, and aerosols. This is really important to make sure your hay isn't being wasted. Make sure the storage space is easily accessible. Do Not stack hay higher than you can safely move it, this is really critical when dealing with round bales. Stack new hay behind the older hay Do Not stack on bare ground or concrete as it will draw moisture and destroy the hay. You want to protect your hay from moisture and produce good ventilation. Some good materials include wooden pallets, tires, or telephone poles. Try stacking your bottom layer of small square bales on their sides with the strings facing sideways instead of face up. This will cause an uneven surface which will allow for ventilation. Stack the second layer with the strings facing up, horizontal to the first layer. Stack the third layer horizontal to the second layer, and follow the same for all other layers. This will make them lock in place and stable. If you prefer larger bales, you should still stack them the same way as the smaller bales but make sure you have a tractor that can lift them. If you are storing hay in a shed that only has a roof or a building that one or more sides are open, cover your hay with a tarp to keep out weather elements and light. The sun will bleach out your hay, removing nutritional values, especially vitamin A and protein. If storing outdoors, cover all your bales with tarps and then secure the tarps with heavy-duty tie-downs. Also, you can form a pyramid by stacking the final layers to help shed off snow and rain better than a top layer that is totally flat. Check your tarps on a regular basis to ensure they are securely tied down. Only use tarps that are minus any holes or tears. Round bales should be stored on the wrap or twine side and are butted end-to-end in long rows. Move rows to face north and south so winds cannot create snow drifts and both sides of the row will get sunlight for drying purposes. Do not arrange rows with the twine sides touching each other. This can cause a collection of water between the bales. If your bales have to be placed side by side, leave 2-feet between the bales. The space for rows should be at least 3-feet apart so water will not run off from one row to another. Let's face it, a certain amount of hay stored outside will spoil at some point. This usually depends on whether it's net wrapped or twined, the level of rain and snow you receive during the storage period, the kind of soil the bales are stored on, and the amount of space that is available for spacing between the bales.